July 7th, 2015 - Baltimore, MD -- "Why not walk the less-beaten path with style?" That's the question asked every day by the designers and visionaries at Vintage Phuck clothing line. With that very question in mind, the brand is proud to present its first ever sneaker design. This piece has been named the "Moorish Phish". 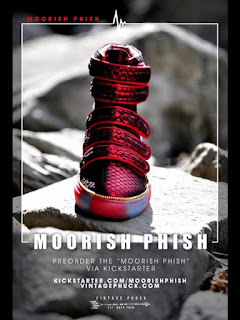 The Moorish Phish was created according to the idea that everyone is a little bit strange, and from time to time each one of us can feel like a fish - or rather, "phish" - out of water. If you've ever felt like a phish out of water, try beating against the current in shoes that reflect who you really are. Embrace the Moorish Phish today.